Are there valve caps that show the tire pressure? Is there something similar for bicyles? it would help less careful riders when it's time to pump more air in them. These types of valve cap gauges aren’t recommended - either for cars or bikes. They work by bypassing the schrader valve in the tire and using a cheap spring-based pressure gauge in the cap. First, they’re wildly inaccurate even on cars. By the time they show red, you’re riding on your rims. Second, they’re cheaply made and a significant second point of failure. If the cap is just a bit loose, the o-ring gets just a bit of dirt in it, or the valve cap gets knocked the wrong way, they will start bleeding air. This is most likely why they aren’t sold in the higher pressures that bikes would need. Finally, as @Argenti noted, many riders adjust their tire pressure depending on the road or trail conditions or their desired degree of ride comfort. 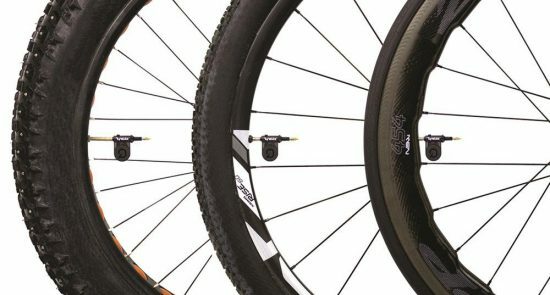 Most bike tires can take a wide range of pressures, unlike cars which have a very narrow band. Conclusions: I’d just get used to squeezing your tires (for the lower pressure of mountain bike and comfort bikes) and/or topping off regularly (especially if you have a road bike). I think RoboKaren's answer is on point about avoiding those cheap gauges which will probably cause more problems than help. For completeness sake, I point to the fact that the only "bike-specific" tire pressure monitors on the market appear to be high-end wireless digital versions that send data continuous monitoring data to a smartphone. Quarq, SRAM’s data and digital technology brand, today announced the launch of TyreWiz, the first-of-its-kind tire pressure sensor for road and mountain bike riders. The real-time monitoring device – designed to help riders reduce tire wear, improve compliance, and boost speed – is being debuted at Sea Otter this week and will be available on June 1 exclusively on Quarq.com. The two-sensor package will retail for $199. It does have a pass/fail indicator lights, with the threshold pressure set by the smartphone app. The application is definitely focused towards "pros" who want to finely tune pressure or monitor it during events (e.g., gravel races). Once installed, TyreWiz relays tire pressure data to a cycling computer or a smartphone every second. The TyreWiz app provides personalized recommendations and pressure alerts. For the first time, riders will have the ability to use highly accurate real-time information to make decisions that can affect rolling resistance, traction, tire wear, and rider comfort. The real time continuous data stream suggests they are only intended to be run for events not as an everyday, day in an day out monitoring device. The "long" run times are 300 hours, or 12.5 days of continuous monitoring. I think the easier option will be to pump your tires up to your desired pressure, give a thumb press to see how hard they resist and occasionally conduct a "squeeze test" as suggested by RoboKaren. They talk with your head unit or smartphone. They have LED lights that tell you too low/high as well. Not the answer you're looking for? Browse other questions tagged valves or ask your own question. Does a typical floor pump have an integrated one-way valve? How to inflate a tire with a Presta valve? What type is my bike valve, and why can't I pump it up? Do tire / tube / valve combinations that don't leak air exist? How can I avoid tearing the valve loose from an inner tube with a wheel lock?